ubrac is a rich territory with a very varied flora, marked by the impact of climate, altitude and the succession of different backgrounds, grassland or bogs. The Botanical Garden, located near a medieval Monastery – Hospital, is a superb showcase of the rich flora of the Aubrac plateau. 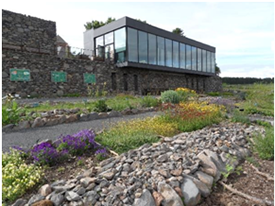 ue to one man’s initiative (Francis Nouyrigat), a first garden was born in the village of Aubrac more than 30 years ago. Because of its good development, this garden went too big for its first location. 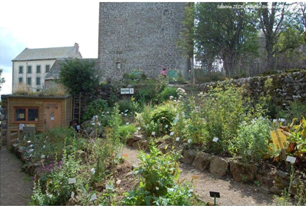 In 2010, the plants were moved to a much wider field, in front of the House of Aubrac. The botanical garden now has an ideal and conducive environment for its proper maintenance, in the middle of a beautiful landscape. he plants are labeled and presented in their restored home environment. On Finds In the garden : bog plants , stream -side plants, forest plants, grazing plates , rock garden plants . ocated in the Sensitive Natural Area “Grande Prairie d’Aubrac”, the Botanical Garden has a large number of plants typical of the pastures. Among the remarkable plants Aubrac, discover glacial relicts, insectivorous plants, heirloom plants and protected plants. A slope is provided at the entrance of the Garden to more easily observe the peculiar geology of the territory, shaped by ice and fire. 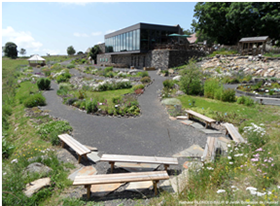 xcursions to discover the flora and landscapes of Aubrac throughout the seasons are proposed by the Botanical Garden of Aubrac every Thursday morning from May to September. Appointment at 9 am at the Maison de l’Aubrac and departure for a walk of 2 km around the village of Aubrac. The return is scheduled around 12h. Price: 8 € adult – 4 € child from 12 to 18 years old – free under 12 years old. or further information, go visit the Botanical Garden website at : www.aubrac-jardin.org. You will find all practical information to visit the garden (physical or virtual visit) as well as a lot of photos !